One of my only sewn items this Christmas was a refashion. I decided to give making a shirt for Shannon another try after I kept the one I made for her birthday, lol. The plan was to actually make the same shirt, just with more "Shannon" fabric. She's a big fan of neutrals, so when I looked through my stash, I knew this one would be perfect. 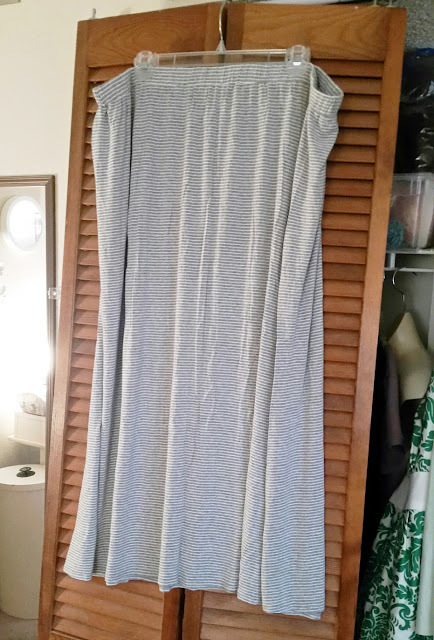 I purchased this skirt at a thrift store a few months ago specifically to refashion - it was a dumpy and boring knit skirt with an elastic waist originally, but the fabric is a lovely, drapey rayon jersey. I'll confess - I originally bought this to use for myself because the fabric was so buttery soft. But since I already stole one gift from Shannon, I knew I needed to make the sacrifice this time, ha ha. The skirt was originally a size 2XL and about ankle length, so I had plenty of fabric to work with. I was even able to salvage the elastic at the waist since it was just threaded in a channel, so now I have a nice piece of 1" wide elastic for a future project - woo hoo! Anyway, when I went to my stash, I knew this would be a great basic item for Shannon. I went with my Plantain/Renfrew combo pattern since Shannon likes her shirts fitted at the bust and then flowy around the tummy. I was able to fit all of my pattern pieces on my fabric except I didn't quite have enough width for my second sleeve, so I will confess that I did a little creative piecing at the back of one sleeve. I don't think anyone would even notice in this basic fabric, but there it is, lol. I did have a little snaffoo with this project that I don't normally have (of course, because I was making it for someone else and I was on a deadline). 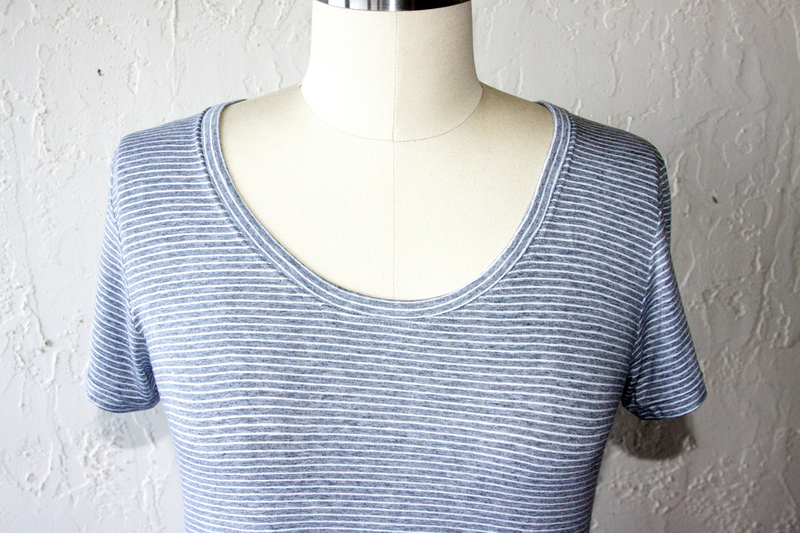 I stitched the neckband like normal, and then top stitched with a twin needle all around just outside the seam. I was able to keep the neckband piece straight with the stripes which I think looks really cool, so I thought it was done and I was really happy. When I went to stitch the hem, I noticed that the neck band top stitching was already coming undone in the back - when I looked closer I saw the wool nylon on the bobbin thread had pulled out from under the top stitches with stretching the shirt. Not good! I tried to just fix that spot, but to no avail. I had cut the bobbin thread too short. I finally just ripped the whole thing out and sewed it again making sure to give a good overlap to the stitches this time and it worked fine. It's just so weird I've never had this happen before, but now it makes perfect sense. And that is Shannon's shirt :) I'm sorry to say I have no modeled shots of this shirt, but considering there is quite a bit of snow where she is I'm willing to forego this time. I will confess that it took a lot of restraint not to embellish this shirt. It's a perfectly fine shirt, don't get me wrong, but it is undoubtedly the most boring thing I've ever sewn, lol. I contemplated putting a floral knit mini pocket on it or something, but then that would've been to my taste and not Shannon's. My mom and sister agreed that leaving it plain was the way to go. I hope she likes it!